Whereas the phenomena composed of them do not"
also the root conditions of the paṭṭhāna & even the dhammasaṅganī on which the abhidhammattha sangaha [another friend on facebook] mentions is based contains a whole lot not in the suttas it's just the relations & the specific enumerations that are unique to the abhidhamma as opposed to the specific concepts of various wholesome & unwholesome citta based on presence or absence of kilesa"
also abhidhamma never mentioned in suttas, vinaya, or record of first council"
""There is the case where a monk, having gone to the wilderness, to the shade of a tree, or to an empty building, sits down folding his legs crosswise, holding his body erect, and setting mindfulness to the fore. Always mindful, he breathes in; mindful he breathes out. To the fore (parimukham): The Abhidhamma takes an etymological approach to this term, defining it as around (pari-) the mouth (mukham). In the Vinaya, however, it is used in a context (Cv.V.27.4) where it undoubtedly means the front of the chest. There is also the possibility that the term could be used idiomatically as "to the front," which is how I have translated it here." vinaya is monastic discipline. the Buddhadhamma throughout suttas is referred to often as dhammavinaya or doctrine & discipline (one reason suggesting abhidhamma fake)"
it doesn't add up & is very very similar of how mahayana justifies their texts saying "humans weren't prepared for it at the time so it was stored away with higher beings until later point"
i mean i will not say with certainty it's fake but it that's what evidence seems to suggest"
While they introduced a number of new terms and methods, the canonical Abhidhamma texts are doctrinally conservative. Many of the concepts familiar from later Abhidhamma are not found—ultimate vs. conventional truth, mind moments, kalāpas, the idea that each phenomena is defined by its sabhāva or indvidual essence. While some new terms are found, for the most part they seem to have been introduced in order to clarify and disambiguate the terminology, and weren’t intended to convey specific new concepts. That is not to say that there are no new ideas, just that they play a fairly minor role overall. I gave you the pāli link to seaching for the reason yourself, why you never read it? Do you found your opinion by yourself from pāli canon? Or you just believe your professors, but never read any abhidhamma-pāli and commentary-pāli by yourself? Before 1st saṅgāyana, vinaya was memorized & authored by bh. upāli and memorized by his students. Suttanta was memorized by bh. ānanda and his students. Abhidhamma was memorized & authored by bh. sāriputta and memorized by his students. After 1st saṅgāyanā, I explained before. So, we can see abhidhamma-styled suttanta by sāriputta's sutta that memorized by ānanda in suttas, such as D.N. saṅgītisutta, D.N. dasuttarasutta, etc. bh. ānanda, was one of not direct bh. sāriputta's students because in mahāgosiṅgasālasutta said ānanda and the other etadagga often go to sāriputta's school to listen sāriputta's teaching. So, in A.N. ekakanipāta etadagga-pāli, buddha said ānanda was the best in sutta-memorizer, upāli was the best in vinaya, and sāriputta was the best in teaching. The meaning of dhammavinaya is dhamma+vinaya = (sutta+abhidhamma)+vinaya. So, by the description it was already included in 1st and 2nd ancient theravāda saṅgāyanā. If you even actually studied abhidhamma, you will see the fact "it is actual that abhidhamma was just a dictionary and commentary of suttanta". Abhidhamma looks like formulas of arahanta. So, alagaddūpamasutta's commentary and introduction of viniaya's commentary said "memorizing whole tipitaka is just a job of arahanta-ariya". Because when arahanta's task done, ādittapariyāya sutta, then he can recite tipitaka full-time. Then when someone memorized many relational stuffs, they will reference each related stuffs together. So, in commentary's and sub commentary's introductions of D.N. and ovādaka-sikkhāpada-vaṇṇanā said "whole 500 arahanta at 1st saṅgāyanā known "
So, that is the reason why no each other mention between each canon. My answer is global more than your opinion. Also my answer more reference than your opinion, too. Because I study it directly from pāli, not just a professor believer like you. So is it a time to begin advance pāli recite and memorize for you, isn't it? Another in my experience, asoka's magathī is very difference from pāli and commentary. So, abhidhamma, except the 4th canon, and commentary can not wrote in that time. And, by the way, how will you explain that fact that language in Abidhamma differs a lot (from linguistic point of view) from that in Suttanta? I explained by the historical reference, not just professor suggestion and imagination like you did. At buddha time, oral reciting&memorizing was the only one way to learn buddha's teaching. So this is the main cause to have commentary at that buddha generation. Because Buddha taught each sutta for just students in front of him. So, when bh. ānanda, bh. sāriputta, and bh. upāli had learned oral teaching from buddha, then after buddha finished sutta, they must asked about state, situation, and meaning of each word in that sutta. 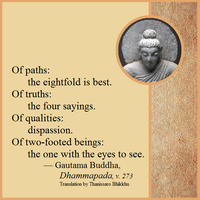 This was called the great dhamma&vinaya commentary. There are very less people in tipitaka who appear to be the most important commentators at buddha generation (A.N. Ekapuggala) : budhha, sāriputta (as dhamma teacher), upāli (as vinaya teacher). The others always listen&learned&asked from those important teachers. The special teaching, about vinaya from buddha to upāli, were appear with upāli literature style in sikkhāpada-nidāna, sikkhāpada-vibhaṅga, parivāra, and the great vinaya commentary (vanished). The special teaching, about dhamma from buddha to sāriputta, were appear with sāriputta literature style in abhidhamma-pitaka, K.N.Niddesa, K.N. Paṭisambhidāmagga, K.N. Buddhavaṃsa, K.N. Cariyāpitaka, and the great vinaya commentary (vanished). Tipitaka strongly keep in pali language because of memorizing vinaya rule that force bhikkhu to memorize tipitaka before live alone or teach others. But the great commentary didn't include in that vinaya rule, so when the time gone by, commentary loose pali form. However, the great commentary translated to siṅhala after 3rd saṅgāyanā and translated back again (with extended comment from siṅhala-teachers) by buddhaghosa and many bhikkhus at 10th buddhist century. I had the same error of understanding until you point that out some time back. Here is the discussion. Mind moment is the mind concept that buddha taught to sāriputta. It is appear in many sāriputta's canon. Also it is the main topic of 1st abhidhamma canon, Dhammasaṅgaṇī. "He grows disenchanted with the intellect, disenchanted with ideas, disenchanted with consciousness at the intellect, disenchanted with contact at the intellect. And whatever there is that arises in dependence on contact at the intellect, experienced as pleasure, pain or neither-pleasure-nor-pain: He grows disenchanted with that too. Disenchanted, he becomes dispassionate (virajjati[=no rāga=notaṇhā]/magga). Through dispassion, he is fully released (=vimutti[ta-suffix=past verb]/phala). With full release, there is the knowledge, 'Fully released ' (vimuttamīti ñāṇam hoti/paccavekkhṇañāṇaṃ). He discerns that 'Birth is ended, the holy life fulfilled, the task done. There is nothing further for this world.'" If you recited it's pāli, you will understand what was I said. Do you even recited or memorized any abhidhamma pāli before distort abhidhamma? or even though sutta pāli? It doesn't make sense to decide something without direct knowledge. Of course, one can trace elements of those concepts back to the suttas and abhidhamma. However, statements about billions of mind moments per second, and so on, are not in the Suttas or Abhidhamma. I love people like you who try to defend Abhidhamma. I personally believe the billions of mind moment idea even though we can't support it with EBT. What I said was now I understand there is EBT Abhidhamma and commentaries. When I said Abhidhamma in the past I was referring to commentaries. I have not read the EBT Abhidhamma except some portion of it. Again, don't you find it really strange, that actual description simply say nothing (just nothing at all) about such (from your point of view, of course) important thing as Abhidhamma? And as for the "ancient commentary, that authored in buddha times" - this is a dubious information. They could be written for example 500 years later after the Buddha. Why? For example, because nothing in Suttanta itself supports such kind of (commentarial) view. If in the core text there is nothing on some topic, then this topic automatically becomes dubious and highly speculative. Citta-khaṇa was sāriputta's theory that derived from above A.N. sutta, so it was not appeared too much in suttanta, but appear too much in sāriputta's canons and in 1st saṅgāyanā's commentary which sāriputta's students were very importance as the sutta's commentators because buddha even praised sāriputta as dhamma-teacher, in A.N. Ekapuggala. So, what you will do if you meditating jhāna, then buddha taught you like that? Won't you try to count citta-khaṇa? My thinking is more simple than you, right? My thinking come with reference text, right? ahaṃ vikubbanāsu kusalo vasībhūtomhi iddhiyā. @Footnote: 1 Ma. dakkhiṇeyyāsi . 2 Ma. Yu. -palippati. Furthermore, if you actually studied paṭṭhāna, the 7th book of abhidhamma, and try to use paṭṭhāna in vipassanā-meditation, you will know how citta must fast to process every steps in paṭṭhāna. Also, you can see those all citta processes actually happened. It is not just a theory. Also, the khaṇa topic that appeared in kathāvatthu happened after above sutta in A.N. Ekakanipāta, so that topic can not the origin of khaṇa in abhidhamma. And, If I am person who listening that A.N. sutta, I will use just an hour to make effort to count citta khaṇa. So, why I have to wait for hundreds years to make this very simple demonstration? Another, how arahanta, such as sāriputta or moggallāna, in buddha time can explained below context without citta-khaṇa to their doubting students who never enlighten any magga? Or it is general possible that thousands monks in buddha time never asked about below context that appeared in too many sutta, can it? So, for me, your opinion are not make sense anyway. Therefore, I still keep the opinion that "billions of mind moments per second" was the comment from ancient commentary that derived from buddha time and appear in 1st saṅgāyaṇa, because it is more make sense and compatible with A.N. sutta, paṭṭhāna, and monk's behavior which I explained above. Last edited by theY on Fri Nov 24, 2017 2:30 am, edited 2 times in total. Would you be so kind as to give a link to translations, or a link to a site such as Sutta Central where it is easier to work out exactly which passages you are quoting? I already searched it in google before you asked for it from me, but I didn't found the translation. I think it is very easier than me for you to find it. I am very confuse with english tipitaka's system. I agree that the conclusion such as "billions of mind moments" of citta-khaṇa appeared in commentary. But I don't agree that citta khaṇa never appeared in tipitaka, especially in paṭṭhāna of abhidhamma. You never see the conclusion, it doesn't means there is nothing in the context. It was sāriputta theory derived from buddha's sutta in A.N. that I quoted above. And it is very simple of "the very fast arising and vanishing of citta" that every samatha and vipassanā practitioners can notice by themselves. I don't know why you think it needs hundreds years to make this theory, it is not make sense anyway. Buddha > abhidhamma > sāriputta > sāriputta's students > 1st saṅgayanā's abhidhamma and ancient commentary (ānanda was sutta-memorizer, not abhidhamma) > 3rd saṅgāyanā's kathāvatthu > ancient commentary translated in siṅhala language > siṅhala language ancient commentary and siṅhala language new commentary > buddha ghosa all commentary translation back to pāli & merge & rearranging. You have a very low knowledge, Zom. Commentary already explained it but you still never notice. Commentary already said, but you has not ability to read it, Zom. Whatever texts added after was marked the author reference in each place, that added, in commentary. If they mixed it fussy, you may can not know "this is added", now. Certainly. I did say that the basic ideas are in the tipitika. Agreed. This experience is reported by meditators quite frequently, though often not at the "billions per second" rate. OK, I see the confusing. The commentaries were written down hundreds of years later. However, that doesn't mean that the ideas were not much earlier. My reading of the suttas suggests that they are very brief summaries, and that the Buddha and his students were providing a lot more details (this is said explicitly in a number of places), so it would not be unreasonable if some of the practical advice in the Commentaries was quite early. Yes, the commentary happened just in a second that buddha finished each teaching. Although, the target listener(s) can understood that sutta, but it didn't means the others, such as ānanda, can understood that sutta, too. If we take bare facts, theravadin abhidhamma was composed by some scholar monks from 250 to 350 BCE - the gradual process of its composition is well seen. By the way, some other scholar monks composed their own versions and one of it (sarvastivadin) is well preserved and differs much from theravadin one - unlike suttas and vinayas which are the same. Many monks (thousands, according to chinese pilgrims Xuanzang and Faxian) in India plainly denied Abhidhamma as heretical teaching (this fact alone could be possible only if Abhidhamma was a later composed material). But no "pali" will help here to know and understand that. One have to take into account the history of Buddhism (and not a religious version, but academic, that is, unbiased, one), buddhology, indology, linguistics. And here western scholars, whom you dislike so much, are more proficient than any traditional theravadin scholar monk, who confines himself only with religious data of his own tradition.